Explorers of every age will love our Broken Arrow Tour—Sedona’s most exhilarating off-road adventure. Offered exclusively by Pink® Jeep® Tours, this excursion is the area’s only tour to feature four-wheeling action atop the iconic red rocks. Your journey begins at the Pink® Jeep® Plaza. 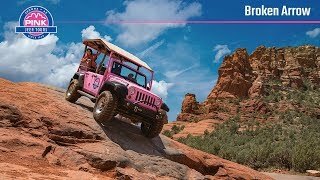 After a quick overview from our skilled guides, you’ll climb aboard an open-air Pink® Jeep® Wrangler that’s custom-built to safely tackle the rugged desert terrain with ease. Enjoy a short drive through town while your Certified Interpretive Guide dives into Sedona’s rich past. Then it’s time to hold on tight. As soon as you hit the trail, you’ll discover what our vehicles do best—crawl over desert rocks to the most remote areas around Sedona. Some of Hollywood’s most beloved westerns were filmed here, including Jimmy Stewart’s aptly named “Broken Arrow” (1950, 20th Century Fox). Majestic photo ops await at your first stop. Take a short walk to vistas that beg to be photographed and shared with friends. The trail winds through Coconino National Forest to your second stop. Here, a panorama of towering rock spires and unique geological formations gives you a grand sense of scale. Look skyward to spy Sedona’s White Line—famous amongst thrill-seeking mountain bikers for its seemingly impossible path along a cliff face. Then, it’s back aboard your Pink® Jeep® for more off-road fun before the tour’s grand finale: The Road of No Return. You’ll quickly see how this run earned its name. Hang on as your guide uses superior all-terrain driving skills to navigate rocks, ruts and roots on your way to the bottom of this exciting descent. After a final ride through the forest, the smooth roads of civilization greet you for your return to Pink® Jeep® Plaza. With an adventure full of wonders behind you, just one thing remains: a craving for your next off-road adventure with Pink® Jeep® Tours. Awesome! It was our favorite tour of the trip!! We all loved it. Our guide was the best!! We could hear her well, she was fun and very informative! !